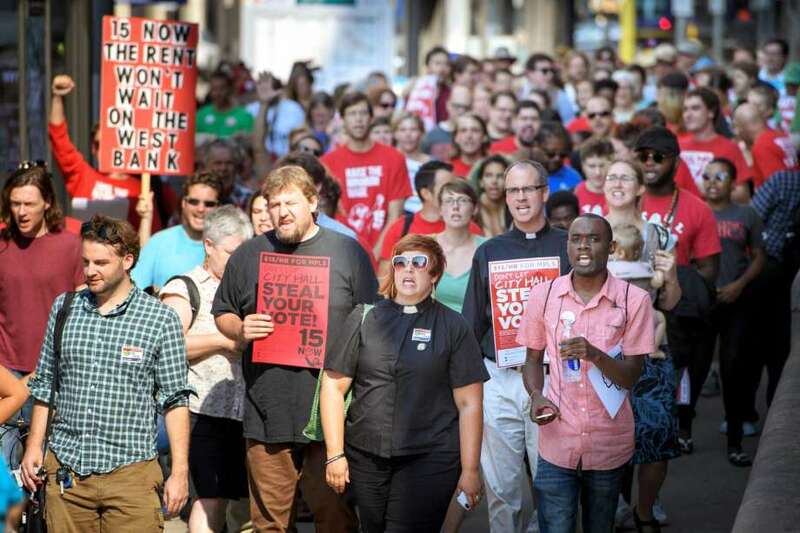 Socialist Alternative and 15 Now Minnesota have been fighting for a $15 an hour minimum wage in Minneapolis for over two years. Over that time, $15 an hour went from a far-out proposal from cities like Seattle to being supported by 68% of Minneapolis residents. Through grassroots organizing, strikes, and demonstrations, low-wage workers – not Democratic Party politicians – have decisively won the battle of public opinion. Even though the national Democratic Party theoretically supports $15 an hour in their platform, Minneapolis Democratic Party politicians have been a principal obstacle to winning. It shows the deep ties the Democrats have with big business, even at a local level, and points to the need to build an independent political challenge to their rule. With the exception of one Green Party City Council member, the Democratic Party dominates at all levels of government in Minneapolis. With no Republicans, they are the sole agents of big business and the developers in City Hall. The Twin Cities are home to 17 Fortune 500 companies – the highest concentration in the country – yet also the worst racial inequities in the nation. A staggering 48% of black people in Minneapolis live in poverty. There have been no substantial reforms to the Minneapolis Police Department following the murder of Jamar Clark, which sparked nationwide protests in November 2015. There is ambitious urban development taking place intended to attract young professionals back into the city and, at the same time, pricing working-class people out of their historic neighborhoods. The Democratic leadership in Minneapolis has used every tool to try and block $15. When Seattle passed $15, the leading Democratic Party politicians in Minneapolis stayed quiet. After fast-food workers started going on strike demanding $15 an hour, Democratic Party Mayor Betsy Hodges sharply opposed $15, instead favoring a “regional strategy” with no plan to achieve it. We persisted, pulled together a broad labor and community coalition, and collected nearly 20,000 signatures to put the question of $15 directly to voters through a ballot initiative. The Democrats in City Hall voted to block our initiative, claiming it was illegal. We took them to court and won, and a judge ordered the city to put $15 on the ballot. Then the Democrats in city hall turned to the Republican-dominated Minnesota Supreme Court to block $15. They even welcomed the Chamber of Commerce as an ally on the appeal, allowing them to file their own separate legal argument to block $15 from voters. One Minnesota Supreme Court Justice was even Donald Trump’s potential choice to replace Antonin Scalia on the U.S. Supreme Court! In the end, the Democrats in City Hall succeeded and prevented $15 from appearing on the November ballot, despite 68% of Minneapolis voters supporting the proposal. This shows how far the Democratic Party will go to defend the profits of big business. Throughout this process, big business had consistent fighters for their interests in City Hall. A crucial ingredient to how $15 was won in Seattle was socialist Kshama Sawant using her city council seat to build 15 Now throughout the city. Socialist Alternative sees elected positions as a platform to build movements, not just a space to argue with big business representatives. With that one seat in Seattle serving as an organizing hub for social movements, Kshama has dramatically shifted the political landscape. To win a $15 minimum wage in Minneapolis, we have to follow on Seattle’s lead. We need an independent political alternative to the big-business Democrats who run our city.